Buying more shares when prices are low is the recipe for long-term investment success, and dollar cost averaging will accomplish that without the guesswork involved in timing the market. When it comes to investing strategies, it seems as though everyone from the multi-billion dollar portfolio manager to the local mechanic has a theory. Passive or active management, buy and hold, technical or fundamental analysis and value investing are but a few examples. However, dollar cost averaging is a long-time strategy particularly suited for individual investors, at least those that don’t have $250,000, $500,000 or a million dollars on hand to meet private wealth management minimums. Dollar cost averaging is the systematic process of investing a fixed dollar amount on a predetermined basis, such as monthly or quarterly, regardless of market conditions. The result of this approach to investing is the fixed dollar amount buys more shares when the price falls, and less as it rises. One of the basic principles of dollar cost averaging is to remove the concept of market timing from the equation. As dollar cost averaging proponents are keen to point out, investment novices and professionals alike have been burned numerous times trying to get in and out of the market at just the right time. There have been countless studies done over the years showing the impact of missing just a few key days in the market. For example, if you had missed the 90 best performing days in the stock market from 1963 to 2004, your average return would have dropped from around 11 percent to just over 3 percent. That’s just 90 days out of about 10,000 trading days. Perhaps as important as taking the guesswork out of the investing process, dollar cost averaging is also a means of implementing an on-going, consistent savings regimen; a good idea regardless of market conditions. In fact, many people already employ a dollar cost averaging strategy, though they may not realize it, in the form of 401(k) or other qualified retirement plan monthly contributions. Investing entails assuming some measure of risk, there is no avoiding this simple principle. Minimizing that risk is one of the key components of a dollar cost averaging investment approach, though that is all it does–minimize risk. Yes, dollar cost averaging ensures more shares are purchased when prices fall, but it does not address the strength of the underlying security itself. This is part of the reason many small investors opt for dollar cost averaging using mutual funds to further minimize portfolio risk. While the numbers may be small, this example illustrates the value of dollar cost averaging. 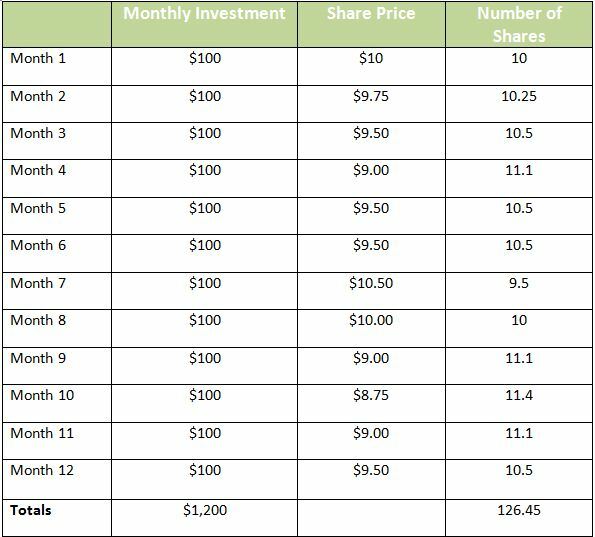 Instead of investing $1,200 in month 1 and receiving 120 shares in return, using dollar cost averaging results in an additional 6.45 shares because as the price drops, the same $100 buys more shares. In this instance, if the shares simply return to their initial offering price of $10, this investor would see a positive gain. The key to dollar cost averaging success is to maintain it, regardless of what the market did or didn’t do on a particular day. In fact, the occasional share price drop will work to the benefit of the dollar cost averaging investor. Mix and match these investment strategies to fit your needs. What Is a Closing Sale? GOBankingRates > Investing > Strategy > What Is Dollar Cost Averaging?